I grow weary of the ordinary world so much so that my once fair skin has turned a ghostly white & my hair as white as snow. Will you journey to wonderland with me once again? 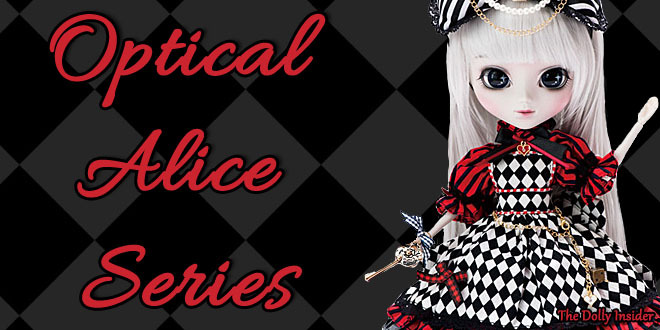 A beautiful optical illusion named Pullip Optical Alice will be kicking off the 2017 Pullip lineup of dolls. 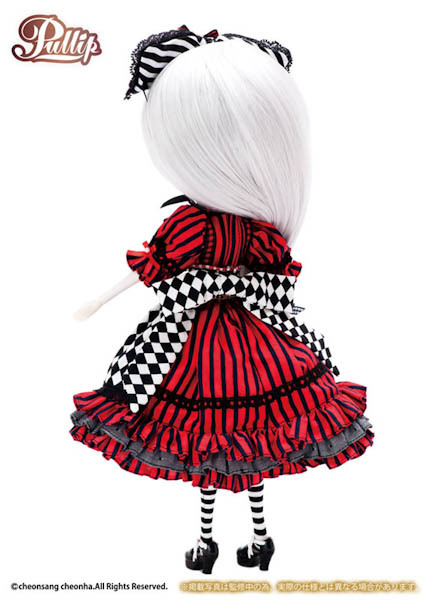 According to Groove Inc Optical Alice is part of a collection of dolls from the Optical Alice series. I'm curious to see what Groove Inc has in store for this series. Will we be greeted to a cast of new characters, or will it be the standard Mad Hatter & Queen of Hearts? I think it's safe to say that the Pullip brand has a special affection for this beloved story. Surprisingly, Optical Alice silhouette is visually pleasing. Normally checkered print and vertical lines are distracting but this weird mixture suits this girl beautifully as it fits the name "Optical" Alice to a "Tea". When I first saw photos for Optical Alice, Azone International's Snow Black Princess Aika immediately flashed into my mind. To me they look kinda similar with the eye-catching vertical shapes, bow details on the dress, and the fit of the dress. 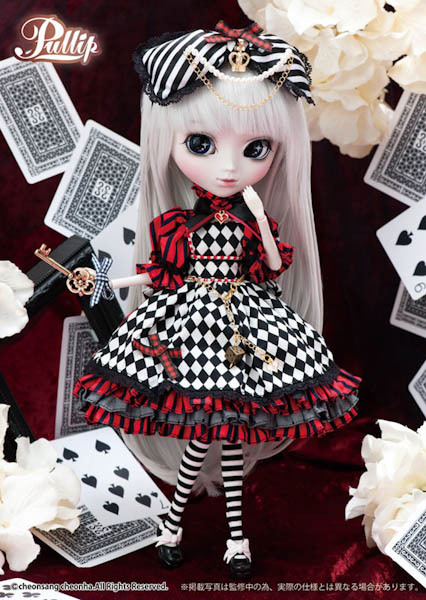 Will you dive into Wonderland with Pullip Optical Alice or will sit back and wait for her return? So does Groove Inc get a pass for their Optical take on the Alice In Wonderland story. Or should Groove Inc finally say Auf Wiedersehen to Wonderland! When I first saw this doll I immediately thought of the Blythe Alice doll with the silver hair and red dress, a doll I had really wanted but the price wasn’t right so I got another that I ended up liking just as much. I like this color scheme though she is a bit pattern heavy. Oh your right, Neo Blythe Dark Rabbit Hole & Optical Alice could be distant cousins. That’s nice that you were able to find another doll to enjoy in place of Dark Rabbit Hole. Did you order a Blythe or a different doll? 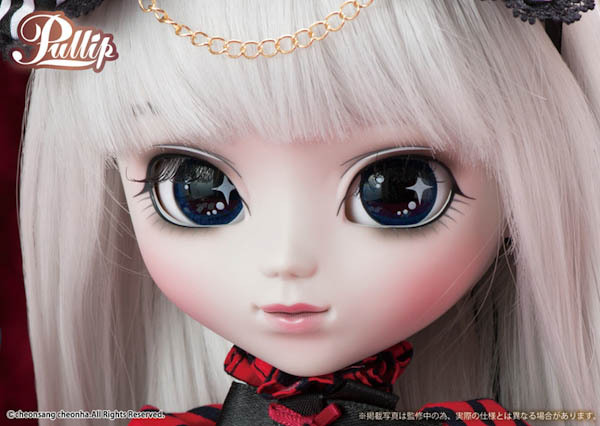 Thanks for leaving a comment on Pullip Optical Alice. I got Blythe Cadence Majorette instead, my first and only Blythe (so far). 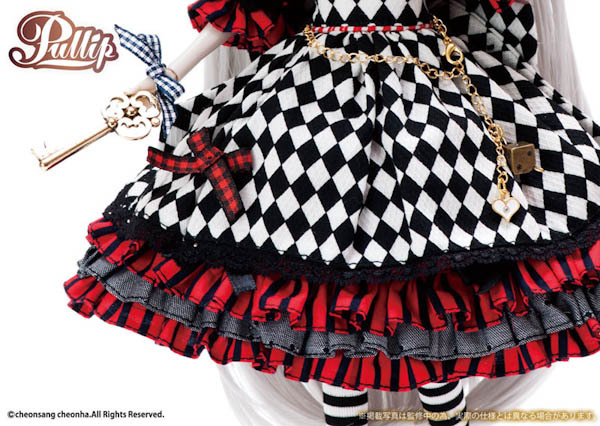 I like her a lot and her outfit is more my style, but I still wouldn’t mind having an Alice doll in red. Oh Cadence Majorette is a such a beauty! Thanks for letting me know which Blythe you purchased. I have a weakness for Alice in Wonderland merch and since I only got into Pullips this year I’m not really feeling the Alice fatigue yet. Although I understand where the fatigue is coming from because there are so many. I really like this one but the question is should I buy another Alice. I already have Classical Alice and the Sepia version of Classical Alice. My favorite thing about this doll are her eyes and her makeup. Her outfit is really nice too but it has a color scheme I’m very partial to (red, black, and white). I’m also very surprised that the checkered pattern and vertical pattern work here. It also really fits the optical theme. You probably won’t like my response or better yet your wallet may not. Since you like the outfit I think you should jump in and order Optical Alice. 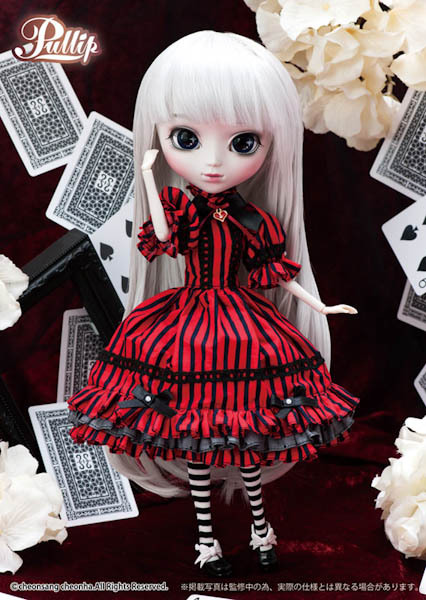 She’s a totally new version of the other past released Alice themed dolls. Thanks for chatting with me about Optical Alice and if you do decide to order her don’t hesitate to come back and allow your beautiful girl to Say Hi. 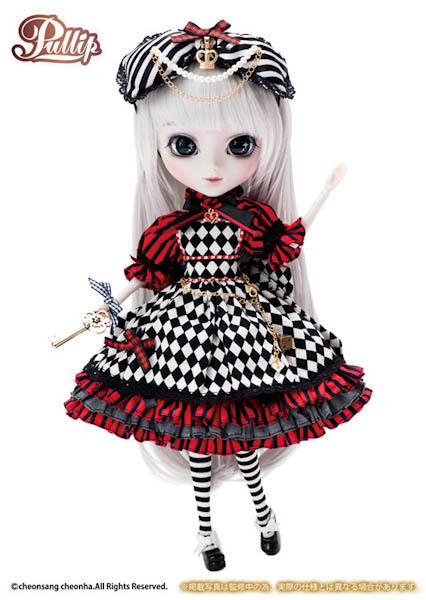 I like Alice in wonderland but i think it’s like Sailor moon’s Pullip, too many is never good. 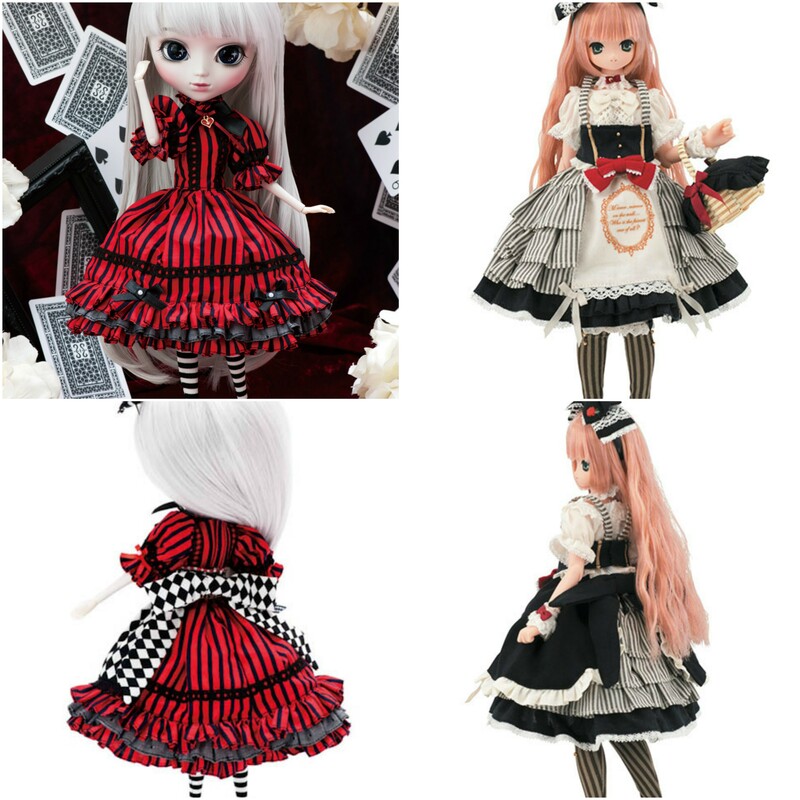 Plus, she look like too much to some other Alice’s Pullip, she’s nice for person who like this style but i think, Groove haven’t more idea than many years ago, even they release sometimes, some great doll, it’s disappointing to see they cannot be more creative. The doll will be loved by people who haven’t yet the other Alice’ doll but for my part, i don’t buy this doll. I wonder if now and days for dolls companies if it’s more about being safe and staying in their comfort zone instead of being creative and taking a risk. The Alice theme must be providing Groove Inc a steady income since they release it so many. That’s a great point you brought up about collectors who already have an Alice doll in their collection. I imagine it can be a bit dull & it makes me wonder what’s separating one Alice from another Alice. 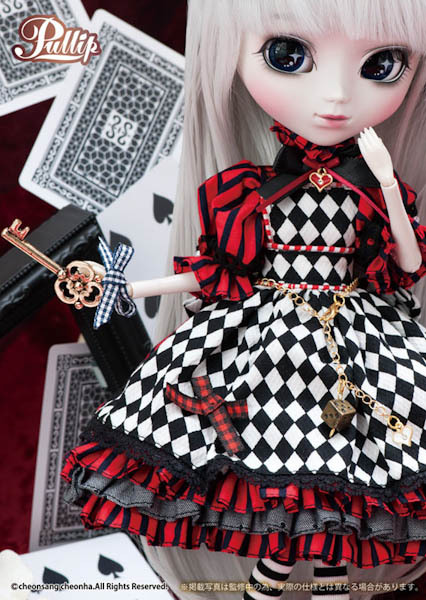 Thanks for sharing your opinion about the 2017 Pullip Optical Alice! Thank you for your response, yes i think the same thing about safety for companies, many of them make this, but playing the security is never without risk to annoying the most older collectioner of their doll. I hope to see most beautifull doll for 2017. I really like her faceup a lot. The makeup on her eyes is very nice and I like the dark to light color on her lips. Feel indifferent towards her outfit, but overall she’s cute! Her lips are a nice touch, I also love how her face has a hint of blush. At first I thought her eyes where pitch black but looking at them closer the iris is blue while her pupil is black. Her outfit is a lot to take in. So far 2017 is off to an interesting start! Alice in Wonderland is one of my favourite themes and I really adore this version of Alice. 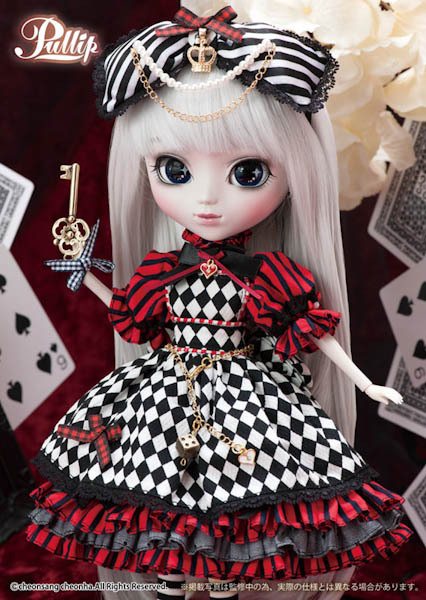 I wish I could get her however I already have two versions of Alice, Steampunk and Monochrome and to me, her face is similar to my Monochrome Alice. I would be interested in a Queen of Hearts should they do one for this line. I only have Mad Hatter from that series but no Queen of Hearts yet. I’m sure some fans are probably getting tired of seeing revamped versions of Alice especially since they already did one this year. I am surprised they are releasing a new version in the same year as the Steampunk Alice series though. I must admit, they always bring something new with this theme but then I may be biased as I do like the story of Alice in Wonderland. My complaint with Groove seems to be the headpieces that come with these dolls. They really don’t stay on very well. Both the ones that come with my two Alice versions constantly fall off so I never bother using them anymore. The headpieces add a nice detail to the overall doll, so its a shame that Groove hasn’t solved this issue. In the past I was so over Alice dolls but now I finally understand why doll companies resort to the Alice In Wonderland themes so often. It has that cute & playful quality which pairs perfectly with dolls!